Hospital visits can be stressful even under the best of circumstances. When someone is dealing with a new diagnosis or worrying about a loved one’s condition, the last thing they want is to wander into the wrong section of the hospital or show up late to an appointment after misreading a map. Hospitals can be intimidating to patients, whether they’re making their first or their 15th visit. They often have to traverse multiple floors, wings, buildings and parking lots. Sometimes, these can sprawl across several city blocks and demand a certain level of familiarity to navigate. Hospital wayfinding solutions offer a way to guide patients through a facility with the least amount of confusion or frustration. A wayfinding app sends a map of the hospital to the visitor’s smartphone, allowing them to navigate the hospital in real time. The technology keeps patients, their caregivers and their visitors safer and happier, which can pay both real and virtual dividends to hospitals wary of receiving negative HCAHPS scores or dealing with the fiscal impact of missed appointments. CenTrak provides a portfolio of Enterprise Location Services that support unique healthcare apps, including wayfinding solutions. Our Bluetooth Low Energy (BLE) beacons and embedded BLE devices can communicate with patients’ smartphone apps to direct them through the facility. Our services also lead to a better wayfinding experience. Here are four ways we work smarter. Reliability – Readable maps need valuable information to build on. Our equipment supplies condition and status updates regularly, as well as location information. Our tags and other devices use batteries with long lifespans to ensure continued function. Ease of Installation – Hospitals and healthcare facilities need location services they can implement without a hassle. Our battery-powered devices can be placed in patient care areas without taking special infection control measures. Interoperability – CenTrak’s open platform can work with a variety of existing applications, such as Hand Hygiene Compliance, Capacity Management, Electronic Health Records and more. While CenTrak offers both standalone BLE beacons, as well as BLE-embedded infrastructure, there are several benefits to leveraging the embedded infrastructure. CenTrak provides the option to license BLE independently from its Second Generation Infrared (Gen2IR™) and Low Frequency (LF) technology, offering advantages for healthcare organizations who ultimately want to scale wayfinding or asset tracking initiatives to true Enterprise Visibility. 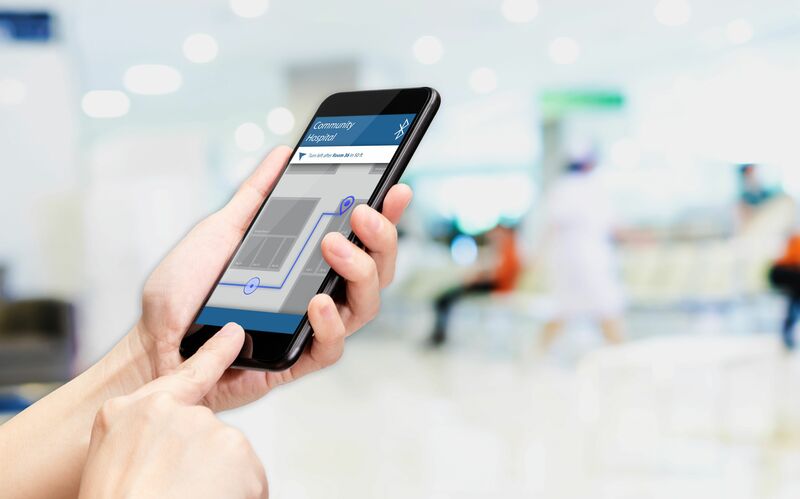 For advanced use cases that require Clinical-Grade RTLS, healthcare facilities have the ability to leverage the same infrastructure’s Wi-Fi, UHF RF, LF and Gen2IR alongside the BLE technology. Contact us today to further discuss how CenTrak can help with implementation of wayfinding solutions in your hospital. Get in touch online, or call us at 215.860.2928 to request a demo.